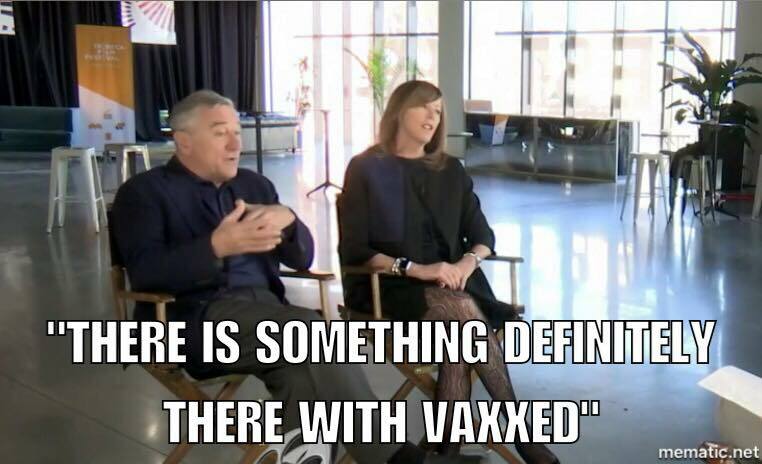 As everyone also knows, within 48 hours after announcing the screening of Vaxxed, DeNiro was pressured into removing the film from the festival schedule. Really, who the hell has the power to slap down Robert DeNiro? At Tribeca! Predictably, the New Yorker’s “anti-denialist” defender of GMOs, Michael Specter, pitched in, proclaiming: "It's shocking…It's comparable to Leni Riefenstahl making a movie about the Third Reich … The fact that a respectable organization like the Tribeca Film Festival is giving Wakefield a platform is a disgraceful thing to do." Whoopee. A controversial documentary revealing primary evidence of a government agency’s deception of the American people on behalf of Big Pharma hounded out of America’s iconic liberal film festival. Helluva thing for a filmmaker to celebrate. Completely comfortable allowing audiences to see certain films and prevent them from seeing others. No legislation necessary. Consider Specter’s “if Leni Riefenstahl made a movie about the Third Reich” remark. Guess what? She did. A few, in fact. And I’ll bet film festivals show them all the time. And I’ll bet that if anyone tried to browbeat a festival to pull Triumph of the Will, Penny Lane would be in high dudgeon urging the organizers not to cave to the pressure. So, yeah, this little act of censorship, in which liberal cultural workers anathematize a film criticizing a pharmaceutical company and a government agency, more than they would a film glorifying the Third Reich, is indeed a momentous moment in film history. We should all let that sink in. Triumph of the shrill. It’s not—It never is, is it?—about free speech, you see, it’s about “danger” and the roundness of the earth. Of course, Penny Lane does not know what critique the film contains, and does not know that it is not—by any stretch of the imagination—“anti-vaccination,” because she (like Michael Specter) did not see it before denouncing it, and calling for removing it. Her denunciations did not, and could not, explain by whom, and how, the film she didn’t see had been “revealed to be a fraud.” Her entire argument, and—as we see repeated in Specter’s remarks—the pre-emptive response of almost every defender of vaccine orthodoxy, is: because Andrew Wakefield. Some of the more powerful moments in Vaxxed involve two pediatricians who describe how they rely on, trust, and strictly follow the CDC immunization schedule in their practices. Then they are given the evidence and data from the CDC’s study, gathered via Dr. Thompson. After reading it, one doctor, Dr. Jim Sears, says: “Everything I’ve been telling my patients [about vaccines] for 10 years has been based on a lie and a cover-up.” Another, a young African-American doctor, Rachel Ross, says that from now on, when parents ask about MMR shots for their children, she will tell them she wouldn’t give it to her own child. What led those doctors to that conclusion is the documents of the CDC itself. That’s the evidence that changed those doctors’ minds, and it is to keep you from seeing that, not to protect you from evil Andrew Wakefield, that “very powerful forces” have mobilized to keep this film from screens. But you have to see the movie to understand that. Not that that necessarily means anything, of course. This is just how culture, and medicine, and science are done in these capitalist United States. Keeping the world round, and all. 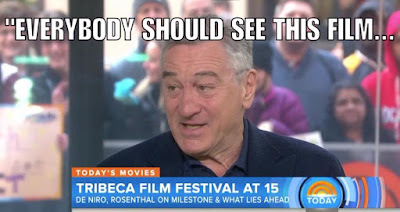 But one might be excused for considering whether what is in fact the capital infrastructure of the Tribeca Film Festival exerted some influence in the decision by Robert DeNiro—or whoever’s in charge—to pull a film critical of the $300-billion-a-year pharmaceutical industry. 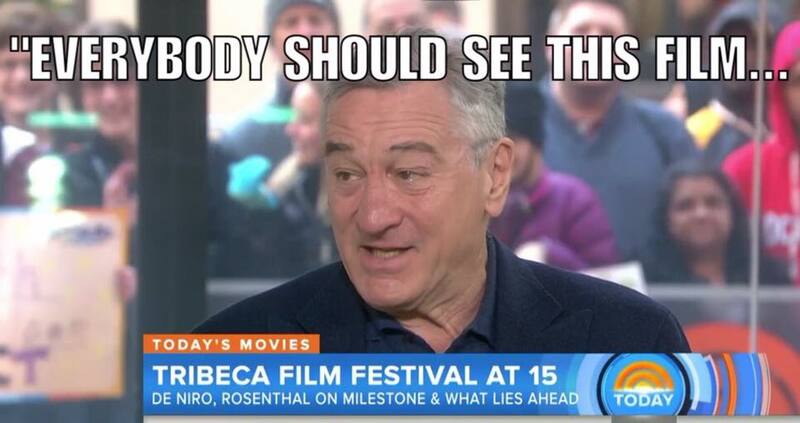 I urge you to watch DeNiro and Rosenthal’s interviews on Good Day New York and the Today Show. You can’t miss the visible discomfort between them. Rosenthal’s practically squirming in her seat; her body and lips are tensed, and she’s ready to spring into squashing any positive mention of the film. When the anchor of GDNY asks DeNiro if he would still like to release the film, and he looks like he’s about to say something positive. Rosenthal interrupts him, snapping: “We’re not releasing it.” It’s hard to avoid the impression that she’s there as his minder. By the way, Penny Lane & Co might defend their censoriousness at Tribeca by pointing out that it’s a private festival, free to exercise its editorial judgement, and there is no issue of government censorship in that instance. True enough. I guess it would have been better if the artists, rather than Mayor Rudolph Giuliani had, in a momentous moment, demanded the censoring of Chris Ofili’s dung-painted Virgin Mary from the publicly-financed Brooklyn Museum of Art. In this case, it’s “only” the ethico-political attitude toward “free (dangerous) speech” in the context that’s in question (and to which, precisely, I object). And I suppose it’s not a First Amendment, only a free-speech issue when the Huffington Post pulls an article that had been published by anti-fracking activist Lance Simmens, which gave a dangerously positive take on Vaxxed. The article was one-fifth about the movie and four-fifths about climate change, fracking, glyphosate/Monanto, PCBs, and the BP oil spill—all discussed in the context of “the corruption of government regulatory agencies [and] the corruption of science and scientific method itself,” and the nation’s failure “to balance out the avarice of the private sector with a regulatory framework in the public sector.” Simmens has published almost 200 articles over 8 years on Arianna’s notoriously indiscriminate hodgepodge of a website, without interference. This one, however, was, I guess, not “free” but “dangerous” speech, and just had to be pulled. Perhaps Arianna was only responding to the petitions of her scores of unpaid columnists. But it does become a First Amendment issue, when, following on Penny and the Round-Earthers’ victory at Tribeca, the film they targeted is also pulled from the WorldFest Festival in Houston, which bills itself as “the oldest Independent Film & Video Festival in the World.” This time, there’s no tale about the revolt of the filmmakers. This time, the festival’s organizer received “very threatening calls … from high Houston Government officials (the first and only time they have ever called in 49 years) ... Heavy handed censorship, to say the least… they both threatened severe action against the festival if we showed it, so it is out. Their actions would have cost us more than $100,000 in grants….There are some very powerful forces against this project.” As the local news reported it: “Ffor the first time in nearly half a century an elected government leader [Mayor Sylvester Turner] has intervened to prevent a scheduled film from being screened.” Truly a momentous and significant moment in American film history. University of Houston Law Professor Peter Linzer says: “The Mayor has no business censoring films at a film festival,” and, as the local news paraphrases him: “unlike private individuals, who have the prerogative to pick and choose what speech they present, the law holds government officials to a much higher standard when it comes to censorship.” Linzer, who served as a litigant for the ACLU on a flag-burning case, also makes the point that: "Speech is not benign. People can get hurt. People can get injured by speech, but it's the best thing we've got." But what does Penny say? Ubiquitous private and public censorship, and nary a word of objection from the liberal cultural elite. It takes a very powerful force indeed to demand this kind of instant, absolute compliance, from Tribeca to Houston. And it’s not the union of safe-speech artists—not Penny’s crew, but Jane’s—which wields it. Are liberals and lefties really comfortable ignoring, accepting, or even applauding what’s going on here? Do they really want to embrace the discourse of "There is no debate!" on this subject? Can the most culturally influential of them, so enthusiastically, with such militant, “scientific” self-righteousness, discipline their friends and colleagues with: "Shut up! I will not permit any discussion of the subject. It is literally beyond question by rational minds.”? Can they seriously issue a mandate that we all must reject—and, indeed, actively shut down—any critical discussion, any cultural expression, of the potential risks of any medication called a vaccine, as if it were equivalent to discussing whether the earth is flat? Can they also mandate that we regard parents, doctors and scientists who do raise doubts about any of the scores of concoctions of pathogens and adjuvants injected into the bloodstreams of their children as some combination of stupid, anti-scientific, and—by some bizarre leap of illogic—reactionary? Somehow, Merck, the drug company that recently brought us a drug (Vioxx) that caused about 30,000 heart attacks, is to be trusted without question regarding any drug it produces that is called a vaccine. Somehow, the FDA that approved that drug, and the CDC that managed the Tuskegee Syphilis Experiment are now to be trusted without question regarding any drug they call a vaccine. Because, you know, the pharmaceutical industry and its once-upon-a-time captured regulators maybe used to do nasty things, way back in the Vioxx days, but they don’t do them anymore. At least when it comes to vaccines. Like the FBI, since J. Edgar Hoover died, doesn’t spy on innocent Americans anymore. That’s why it’s really OK—literally beyond question of rational minds—that vaccines are not subject to the same safety testing as other pharmaceuticals; it is OK that there is no testing of the synergistic contraindications of administering multiple vaccines at the same time; It is OK that, pace Hillary, it is vaccines, not guns, that are the only product in America whose manufacturers are fully exempted by law from responsibility for the harmful effects of their products, no matter how defective their design. And it means nothing—not to be discussed—that the lead author of the CDC paper used to disprove any autism-MMR link now says, with documentary evidence, that the report was essentially fraudulent: "Oh my God, I did not believe that we did what we did, but we did. It’s all there… This is the lowest point in my career, that I went along with that paper." Move along. Nothing to see here. Really, there is nothing scientific, let alone leftist, about such an attitude. Rarely have we seen such an intense campaign in such a brief time over such a specific policy that has so effectively coaxed and browbeat social subjects, with liberals eagerly policing the ideology, to live their compliance as the proof of their rationality. Regarding the specific issue of CDC’s treatment of the MMR-autism link that’s the subject of the movie, there are a few suggestions that I think would be helpful. First of all, Dr. Thompson, who still works for the CDC and is represented by whistleblower attorneys, has been asking for two years to testify before Congress. For some reason, somebody has avoided this. 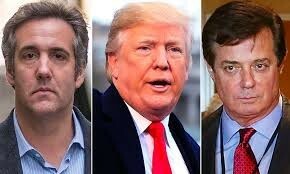 He should be allowed to do testify and present his evidence under public scrutiny, as should those he has charged with manipulating and destroying evidence. Those would include Dr. Julie Gerberding, former head of the CDC, to whom Thompson wrote a letter in 2004, informing her of "problematic" findings regarding an MMR-autism link. Dr. Gerberding left the CDC in 2009 to become the president of the $5-billion-a-year Vaccine Division of Merck, which makes the largest number of CDC-recommend/mandated vaccines, including MMR. Dr. Gerberding recently sold about half of her Merck stock for $2.3 million, so she should be able to take the time off to testify. Maybe Dr. Thompson is a liar, peddling false, self-incriminatory information to satisfy some warped sense of self-hatred. Maybe Dr. Gerberding is a stalwart and principled protector of the public good, whose millions in corporate campaign contributions career emoluments betray no conflict of interest. Let’s find out. We might also consider producing and administering the measles, mumps, and rubella vaccines separately. After all, a lot of suspicion about the vaccine, reflected in the disputed data, has to do with the risks of giving a combination of pathogens all at once to a very young child. Why not just eliminate that doubt? Especially since there is no claimed scientific or medical reason not to. The three vaccines are, in fact, manufactured separately and mixed later, for reasons of cost-saving, not science. In fact, Japan, that nest of scientifically-illiterate flat-earthers, has banned the trivalent MMR vaccine since 1993, after a record number of children developed nasty reactions like non-viral meningitis, including blindness, and loss of control of limbs. Why not give parents and doctors the choice of using single vaccines? I think it would also be sensible to require the same safety testing for the vaccines we pump into our children’s bloodstreams as we do for any other pharmaceutical drug. This is a complicated issue. There is testing of vaccines, but it is not exactly the same as for other drugs. Most testing is done by the drug manufacturers. Testing for efficacy is mainly testing for “immunogenicity”—the ability of the drug to stimulate antibody production. But an antibody is not the whole story of immunity. There are no routine long-term before-and-after tests for adverse effects; most are limited to a few days or weeks. There is no routine double-blind placebo testing, except using a previous vaccine as a placebo. There is no testing for the possible synergistically adverse effects of administering a mixture of multiple pathogens and adjuvants all at once. These differences in testing are acknowledged, and are defended on the grounds that vaccines are a public health necessity. Current legislation is actually seeking to loosen testing requirements. I think the safety testing of vaccines should be strengthened, and should be at least as strict as that of any other drug. 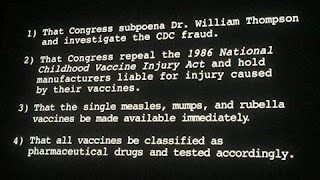 I certainly think the regime of liability-free profit mongering instituted by the National Childhood Vaccine Injury Act of 1986 (NCVIA) is outrageous and should be changed. 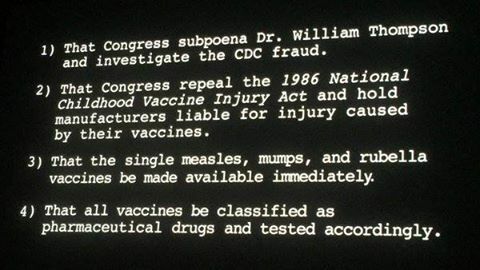 It gives vaccine manufacturers absolute immunity from lawsuits resulting from any damage caused by their products. The government absorbs all the liability, via the Vaccine Injury Compensation Program (VICP), funded by a $0.75 excise tax on all vaccines. It forces injured parties to take their grievances to a special master in what’s known as vaccine court. This is not really a court, but a closed (no public or reporters) administrative review that does not require the pharmaceutical companies to show up, lacks a normal discovery process that might reveal incriminating documents, and is notoriously slow to take up cases and pay complainants’ lawyers. All the costs and all compensation are paid by the public, not the vaccine manufacturers. So, one of the most profitable industries in the world—an industry that spends tens of millions in campaign contributions ($51 million in 2012 and $32 million in 2014), and hundreds of millions in lobbying ($273 million from 1998 to 2009), and whose CEOs take home hundreds of millions of dollars a year—has been handed, by law, the opportunity to make any number of profitable products, which the government will virtually force people to take, with no risk whatsoever of paying damages for the harm they may cause. And liberals and lefties and filmmakers have nothing to say about this except to tell anyone who questions it to shut up. Because when it’s vaccines they’re selling, Big Greedy Pharma becomes Humanity’s Selfless Servant. And what is the likelihood, if we did any of that, if we took the unlimited profit out of it, that we would have nearly 300 vaccines in the pipeline, every one of which, if history is a guide, will be hyped as absolutely, no discussion permitted, necessary for the health of our children (and adults!) and put on the mandatory vaccination schedule? Now, you can agree or disagree with any of those suggestions, and, really, I am open to arguments that might change my mind about them. But I vehemently deny that anything about them is anti-vaccination, anti-scientific, or reactionary. Rather, I charge those who insist that we must not discuss these issues—indeed, must not allow them to be discussed—with taking a position that is patently, and dangerously, anti-scientific and authoritarian. That is the path to the corruption of the scientific method itself. 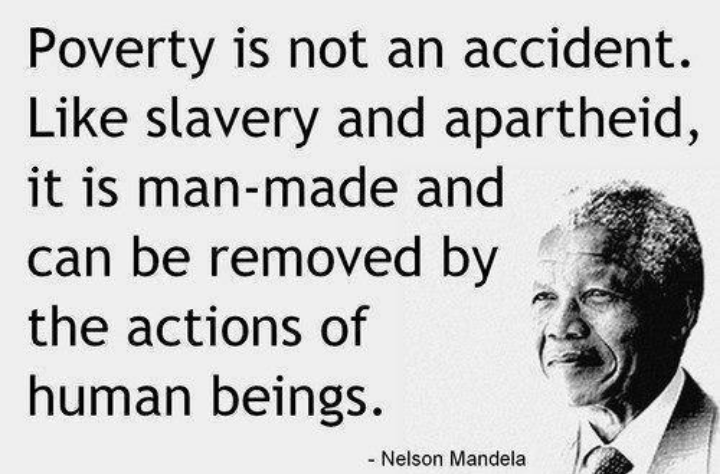 As it happens, these four points—let Thompson testify; make separate M, M, and R vaccines available for parents to choose; require the same testing for vaccines as for other pharmaceuticals; and abolish the liability dispensation given to Big Pharma by the NCVIA—are the entire point of Vaxxed. They are listed on the final screen as the desired take-away. The film supports them with the strong prima facie evidence of Dr. Thompson’s revelations. Again, there’s nothing remotely anti-science or anti-vaccination about it. My main beef here is with the censorship of Vaxxed. Whether these points, and Thompson’s evidence, should be accepted or rejected is a fair subject of discussion. The impediment to such a discussion is never the evidence and data (of which there is too much) or the logic and arguments (which are kind of elementary), it is always the ideologically-driven—in this case, self-righteous—refusal to see them. In this case, too, what must be refused is some kind of command that you must not see them. 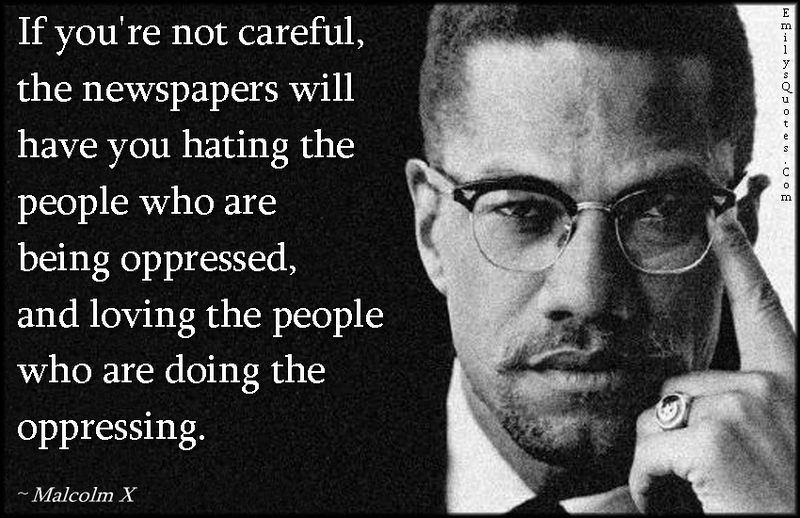 I urge those who are not fixed in that refusal, or intimidated by that command, and are disturbed by the horrific, unprecedented epidemic of autism in American children, and who want to know if there really was data showing a 300% increased risk among African-American boys, to see Vaxxed (and Trace Amounts, which explains why autism affects boys more than girls). Autism rates among American children have increased steadily from 1 in 10,000 to 1 in 68 (or 1 in 45) in thirty years. We should not be forbidden reasonable inquiry into what could make that happen, in every region of the country, at a rate of 6-15 percent a year. An MIT Researcher in the film plots that, at today’s rate of increase, by 2032, 50% of children, and 80% of boys will be on the autism spectrum. Find that incredible? Pick your slightly less horrific projection. Nobody, including the CDC, claims to have an answer to this, and nobody can claim the right to shut down debate about it. We should certainly not be satisfied with the insulting suggestion that it’s not happening, that it’s a semantic problem: there’s no increase in autism, we diagnose more things now—with the implication that scientifically-illiterate parents, before they started reading stupid stuff on the internet, just didn’t notice their children suddenly—overnight!—becoming non-verbal and repetitively banging their heads against the wall. Going for the liberal-guilt jugular, Penny Lane charges that “very possibly people will die as a result” of anyone showing this move. Well, if you’ve known anyone who’s had a child—not possibly, but actually—regress to an autistic state within hours of an MMR shot, if you see this happen in before and after video, as you can in Vaxxed and Trace Amounts, and you see the heart-wrenching, lifelong, ordeal this puts families through—tens of thousands of families a year—then you, and every one of those parents, and every one of their doctors, has the right to see and examine all the evidence and ask all the questions s/he damn well wants about how this happens, and about what and who may be responsible for that. And nobody, not even Penny Lane, has the scientific, political, or moral authority to shut that inquiry down. College English Vol. 31, No. 6 (Mar., 1970), pp. 548-557. 2 Quotes from: Timeline of Events in the #CDCwhistleblower Scandal, The Thompson Transcripts: Shocking Revelations by the CDC Whistleblower - The Thinking Moms’ Revolution, and the documentary film Trace Amounts. 3 Before Vaxxed came out, I was in the process of writing a long post on vaccinations, with the adamant intention of never mentioning Andrew Wakefield. The Wakefield story revolves around that 1998 Lancet article, which (you might be surprised to know) did not say that the MMR vaccine caused autism, but suggested the matter be studied further. The Lancet later retracted the paper after it was attacked by journalist Brian Deer. The whole affair is much more complicated than the standard media narrative has it, and it would take a long exegesis to do it justice, which I have no interest in doing. The most relevant pieces in this context are Vaxxed producer Del Bigtree’s statement on Wakefield and Wakefield's own explanation of the controversy. Google will get you everything else. Updates 5/24/2016: Added endnote 4, with quote from DeNiro's Cannes interview. 5/27/2016: Added link in footnote 3 to Wakefield statement.